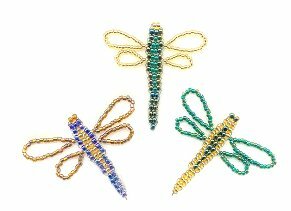 These unique bead kits have been designed by Sue Keast exclusively for Daisy Chain Designs. These little kits have been hugely successful for ages from eight to eighty!! All kits contain the bead wire, beads, comprehensive and easy to follow instructions and a colour photo. They make ideal presents too. You can make them very quickly either for card embellishments, jewellery, christmas ornaments or whatever you want!!! Parental or guardian supervision is required if a minor is to attempt the project (please refer to terms and conditions of supply).